Proper socialization has a huge impact on a dog’s temperament and its outlook on life. When properly socialized, a dog is relaxed and comfortable, rather than fearful, when he or she encounters new things, people, or animals. Socialization is the process of introducing a dog to new experiences so that they become familiar. Dogs that have been properly socialized have learned how to respond to new situations positively without fear or aggression. While it is essential to laying the groundwork for appropriate behavior later, socialization is also crucial for preventing unprovoked dog aggression, which is most often caused by the lack of proper socialization. Dogs who have suffered from poor socialization can experience a number of behavioral problems as adults, some of which are more serious than others. If pups were not exposed to different experiences when they were little, they may end up suffering from different deficits as adult dogs. For example, if a puppy was isolated, as a dog it will probably have great difficulty enjoying the companionship of people and forming close bonds. The lack of engagement and socialization as a pup will often cause a dog to exhibit poor problem-solving skills and a diminished ability to learn. Unfortunately for these dogs, they also have great difficulty coping with their fear. There are different reasons why dogs can end up with poor socialization skills. For example, the dog may have been taken from its litter too soon, which can hurt the pup’s ability to get along with other dogs and make it difficult for it to control the force of its bite. Poor socialization skills can also result if a pup is not given a chance to play with other dogs while it is growing up. In addition, the dog may not have had the chance to play with children to become accustomed to their level of noise and playful aggression. Sometimes pups receive plenty of attention, but they are never given direction and are allowed to behave badly with no repercussions. In addition, puppies that were raised in puppy mills or were abused are also more likely to be poorly socialized. Dogs with poor socialization tend to be very fearful. Some of the most common triggers are children, men, other dogs, and noises. 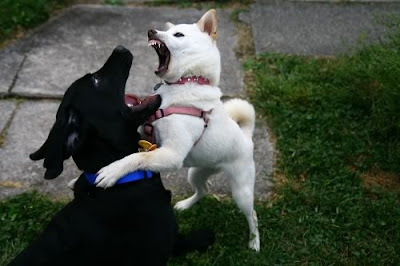 Other dogs that have not been properly socialized react to situations with aggression, which can be unsafe. Dogs that have been poorly socialized are also more prone to negative behaviors like excessive barking, destructiveness, tail-chasing, house soiling, toy possessiveness, attention-seeking, play biting, stranger aversion, and fearfulness on walks. Some dogs can be retrained with concentrated socialization as an adult. However, they will most likely not ever be the dogs they were meant to be had proper socialization taken place when they were pups.